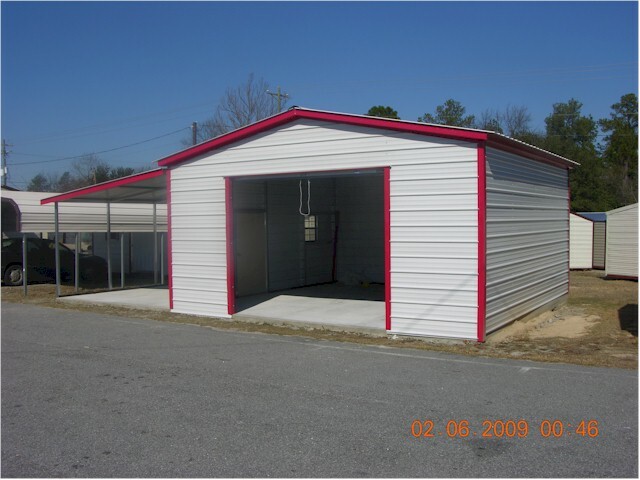 These enclosed carports can be used for garages or workshops. The sizes range from 12 ft. wide x 21 ft. long to 30 ft. wide x 51 ft. long, depending on how much room you need. Height of sides start at 6 ft. and can go up to 10 ft. Roll up garage doors, windows and entry doors can also be customized to fit your needs. We can set up a contractor for pouring you concrete. * Our most popular style is the A-frame carport, but the standard roll roof is also available. Give us a call today to price your new garage!